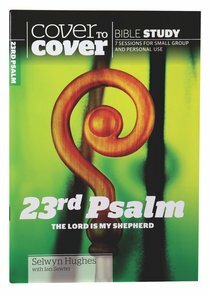 About "23Rd Psalm - the Lord is My Shepherd (Cover To Cover Bible Study Guide Series)"
CWR presents another title in the highly regarded Cover to Cover study guide series. These books continue to provide a unique resource for group and individual study sessions lasting between one to two hours. Each book consists of seven stimulating sessions and includes opening ice-breakers, Bible references, discussion starters and suggestions for personal application. There is an introduction that sets the topic in context as well as helpful notes for group leaders. This Cover to Cover study guide looks at one of the most beautiful and best-loved passages of the Bible Psalm 23. This psalm particularly speaks to people who, like David, are experiencing major upheaval in their lives. However, those who do not find themselves in the middle of trauma should not pass over this part of God's Word. Here we find timeless truths about our Lord which, once absorbed, will transform our perspective on life and enable us to deal with difficulties that come our way. But however great David's revelation of God as a Shepherd was, it was only a partial understanding, for it lacked the fullness of the revelation of the birth, life and death of Jesus. He was the Good Shepherd who laid down His life for His sheep. And so readers of this study are encouraged to view this psalm in the light of the New Testament revelation of our Saviour. Selwyn Hughes and Ian Sewter look at one of the most beautiful and best-loved passages of the Bible. It offers us timeless truths about our Lord which, once absorbed, will transform our perspective on life and enable us to deal with difficulties.